Kinnitty Castle lies next to an ancient druid ceremonial ground (there’s a stone circle behind the castle), lending a mystique to the air. After the Norman invasion, a castle and Augustinian Abbey was built on the site. You can still see part of the original walls incorporated into the present structure. The O’Carrolls were the first clan to take ownership of Kinnitty in the 11th century, along with 40 other castles. A descendant of this family, Charles O’Carroll, was one of the original signatories of the American Declaration of Independence. William O’Carroll erected a new castle on the site in 1630, which was confiscated 11 years later by the English, who, in turn, granted the property to Colonel Thomas Winter for his loyal military service. In 1764, Winter’s descendants sold the estate to the Bernard family. Fifty years later, Lady Catherine Hutchinson, wife of Thomas Bernard, commissioned the Pain Brothers (famed architects of Dromoland Castle and Adare Manor) to transform the castle into its present neo-Gothic structure. Republican Forces burned the castle down in 1922, but the Bernard family rebuilt it. Another two changes in ownership left the castle in the hands of the government. The Ryan family (who can boast a long lineage) bought the castle in 1994, turning it into a hotel. 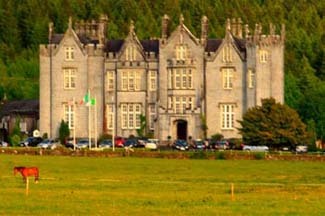 Presently, Atlantic Hospitality Services manages Kinnitty Castle as well as Waterford Castle Hotel. Kinnitty Castle has a lot of steep staircases, making a stay here unsuitable for those with mobility difficulties or those with small children. The castle is also a popular wedding venue. Check to see if a party is booked for the date you’re interested in since the choice rooms may be spoken for. Choose your room carefully; I would opt for one of the state rooms or baronial rooms. Kinnitty is in the center of Ireland, north of the Slieve Broom Mountains and on R421. A car is the best way to get around the area. Receptions. Inquire hotel for details. Over the last few years I’ve had e-mails from people who either love or hate Kinnitty Castle. The castle is not what I would call posh, but filled with loads of character: creaky wood floors, suits of armor, claw-footed tubs in the middle of the bathroom, etc. Guest rooms vary wildly. Try a roomy stateroom with a wooden bed that looks somewhat like the hull of a Viking ship, or a baronial room with a four-poster bed. Sometimes the beds are extra large because two beds are pushed together. Guest rooms are named after historic personalities associated with the hotel. Guest rooms do not have TVs; some rooms are in need of a little care here and there. You may choose to dine in the formal, candlelit Sli Dala restaurant, or the Monks Kitchen, which is thick on medieval atmosphere. The Library Bar is the place to relax in front of a turf fire, and the Dungeon Bar is a pub, which often offers traditional or impromptu music in the evenings.